I am selling two sectional couches of vague historical significance. They are located on Capitol Hill in Washington, D.C. These couches were previously owned by libertarian icon and presidential candidate Rep. Ron Paul. They sat in his home living room during his time in Congress. When he retired in late 2012, Dr. Paul bequeathed them to my roommates and I (a bunch of broke Congressional staffers). We rented a U Haul truck and went to his condo in VA, where he kindly helped us load them into the truck. 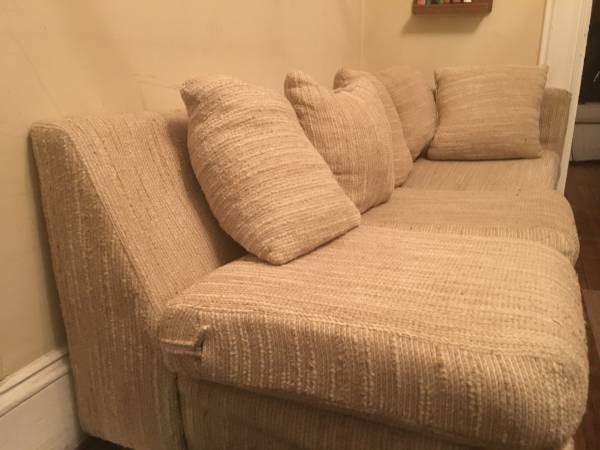 The upholstery is torn on the front of each, but could easily be reupholstered using intact material from the back of each couch (photo included). They come with a bunch of matching throw pillows (pictured). One of them has a full size pull-out bed. We want to make sure they go to a good home, to someone who will appreciate them as much as we did.